Rutabaga is a root vegetable similar to a turnip, but it tastes just a little sweeter. Both are members of the Brassica or cabbage family and can be easily grown in many parts of the world—especially in areas where it is cold. 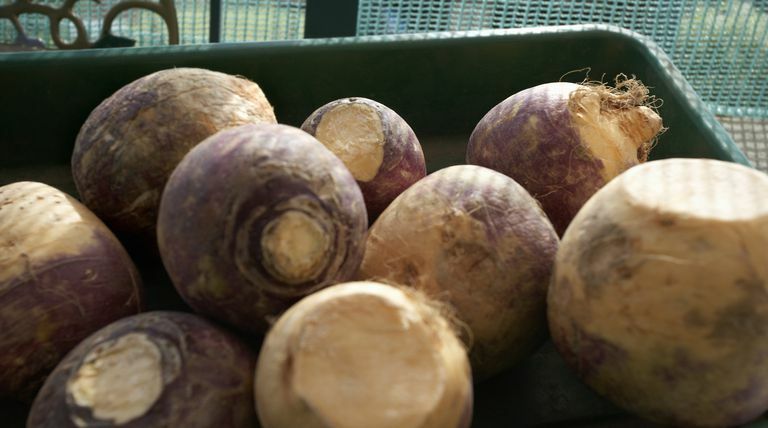 Rutabagas and turnips have a long history of use in food and in social settings. In fact, in some parts of the world (where rutabagas are more commonly called swedes) rutabagas have been carved to ward off evil spirits. Rutabaga is quite nutritious and high in some vitamins and minerals. They're not too high in calories either—one serving of plain rutabaga has only 50 calories. Of course, that calorie count will change if you add butter, oil, or other toppings. The following nutrition information comes from several sources including the United States Department of Agriculture's Nutrient Database. The listing is for one cup of cooked rutabaga cubes. Most of the calories in rutabagas come from two types of carbohydrate. There are 3.5 grams of fiber in a single one-cup serving of raw rutabaga. Fiber is necessary for healthy digestion and can also boost heart health by helping your body to rid itself of LDL or "bad" cholesterol. There are also 7.8 grams of naturally-occurring sugar. While consuming too much sugar (specifically too much added sugar) is not considered healthy, consuming foods with naturally-occurring sugars can be a good way to provide your body with energy for everyday activities. The estimated glycemic load of rutabagas is four. There is almost no fat in a rutabaga. The root vegetable is a naturally (almost) fat-free food. The very small amount of fat in a rutabaga is polyunsaturated fat, which is considered by diet and medical experts to be a better fat for heart health. You'll get a small boost of protein in a single serving of rutabaga. A one-cup serving provides just under two grams of protein. Rutabagas are high in magnesium and calcium, so they're good for bone health, and they're rich in vitamin C, which is essential for immune system function and healthy connective tissue. In addition to the important macronutrients and micronutrients in rutabagas, the food also provides phytonutrients, specifically beta-Carotene which is helpful for warding off diseases including Alzheimers, asthma, high blood pressure and other conditions. Where can I find rutabagas? You'll find those big root vegetables in the produce section of your grocery store. Look for rutabaga that is firm and feel heavy for their size. They'll be coated with wax. It's perfectly safe, but you'll need to peel the rutabaga before cooking. Keep them in a cool place until needed, or if you have a bunch of rutabagas, prepare a rutabaga puree and keep it in the freezer. It will last for up to a year if you use bags meant for freezing. Rutabagas can be eaten raw or cooked. Shaved or shredded rutabaga can be added to salads or used instead of cabbage in recipes. Some people may also use rutabagas instead of turnips in recipes. To cook a rutabaga, you can oast, sauté, bake, fry, boil, or mash them. You can also mash them or add them to soups and stews. Rutabagas pair well with carrots if you choose to combine root vegetables for a side dish. There are very few reports of rutabaga allergies, however, according to the American Academy of Asthma, Allergy and Immunology, there are reports of people experiencing symptoms of oral allergy after contact with other vegetables in the cabbage family. Symptoms may include swelling of the mouth, lips, or throat upon contact. If you suspect an allergy to rutabaga, contact your health care provider to get personalized advice and medical attention. United States Department of Agriculture Agricultural Research Service National Nutrient Database for Standard Reference Release 28. "Basic Report: 11436, Rutabagas, cooked, boiled, drained, without salt."